Like many other women, I like being trendy and follow the latest trends in fashion. But, you have to agree with me when I say that a black pencil skirt outfit can always be integrated in any wardrobe. Even if the fashion crowd is open to new trends, some style staples like the coolest black pencil skirt outfits are still promoted and appreciated. That’s why I decided to give you an overall image on the voguish outfits with black pencil skirt. The classic black skirt may seem to lack any creativity. But the shops offers are so diverse for pencil skirts. However, hundreds of fashionistas need a few predictably stylish outfit ideas. 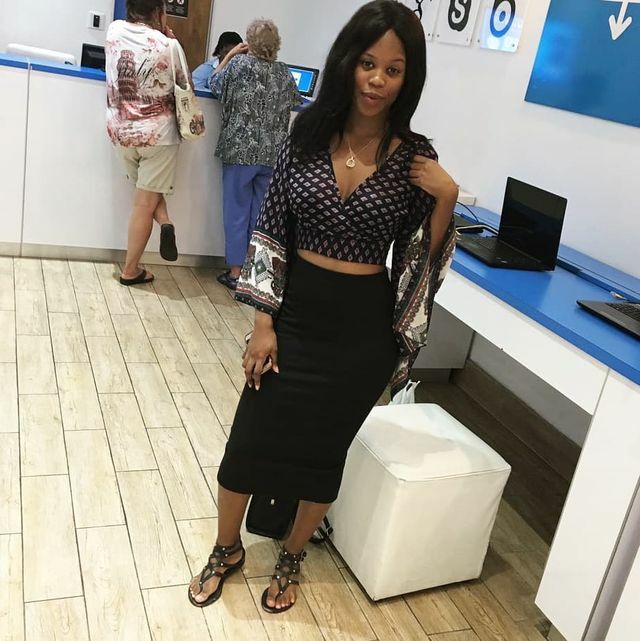 Moreover, you can also stand out from the crowd by pairing these black skirts for women with festival chic tank tops, cropped blouses and even denim shirts. Here are some beautiful black pencil skirt outfits I am sure you going to like. Elegant black skirt outfit ideas equal casual perfection. Develop your personal style and find new street wear fashion combos that allow you to have fun while shopping for new clothes for women. Retailers want to let you know that minis are not only for size 0 girls. Curvy silhouettes look just as fabulous when combined with the chicest skirts of this year’s fashion with buckles, fringes or zippers. I am sure you are tempted to embrace these black skirts outfit ideas, too. To do that, you should take a look at these black pencil skirt outfits. In case you are wondering what to wear with black pencil skirt, hope you’ll find the answer in these pictures. Choose to wear an outfit with black pencil skirt and you will be always trendy. 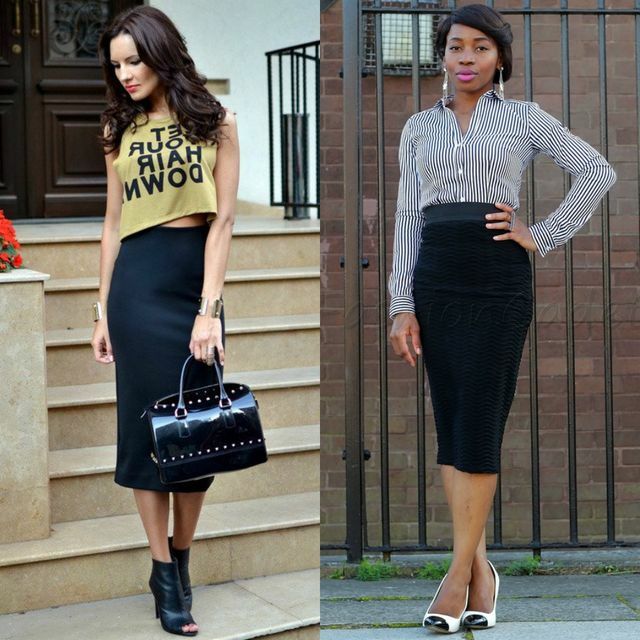 Black pencil skirt outfits are quintessential elements of a work or semi-formal wardrobe. This is definitely not an understatement if you’re looking at past collections of well-known designers. The mono-colored pencil skirt proved to be a basic item to compose elegant sets. What to wear with a black pencil skirt? Let us show you a few examples collected from our favorite street fashion sites. Take a closer look at these images. You will learn what to wear with a black pencil skirt. 1.Knee-length designs that create the impression of longer legs and a slender silhouette are sported for summer casual work outfits. The accessories as well as the tops you team your ‘in vogue’ long black pencil skirt with make the difference. Our top recommendation is the black tube skirt with high waist. 2. Find your own way to mix and match shirts, blouses and even t-shirts with these pencil skirts for work. These are inspiring pictures that gives you the answer to the question what to wear to work in summer with pencil skirts. 3. If you follow the coolest street wear blogs on the net, you’ll definitely observe a wind of change in the way designers see the black pencil skirt. 4. Oversized sweaters will add a nonchalant air to your sets whereas refined and girly tops or shirts are super-elegant when combined with these staples. 5. Kim Kardashian is one of the non-traditional style influencers. Follow her footsteps and nail down a similar ‘good girl gone bad’ look with a button down short cardigan. 6.Long black pencil skirts have made a surprising debut in the runway shows of the last season. We were looking forward to see trendsetters rock suggests how to wear long skirts casually on the street. 7. The fashion flock just can’t deny the refined air emanated by neutral tones. The relation of designers with black is an on and off love story. 8. These images with black pencil skirt outfits, prove that you should incorporate the pencil skirt outfit into your wardrobe. Match them with romantic tops and shirts embellished with creative details and prints. 9. Are you looking inspiration for your outfits at work? Try to mach a shirt with a high waist black long pencil skirt. The result will be gorgeous. 10. You don’t know how to wear a black pencil skirt when is cold outside? Here are two pictures that might help you next time when you have a lack of inspiration. 11. Be casual and sweet!!! 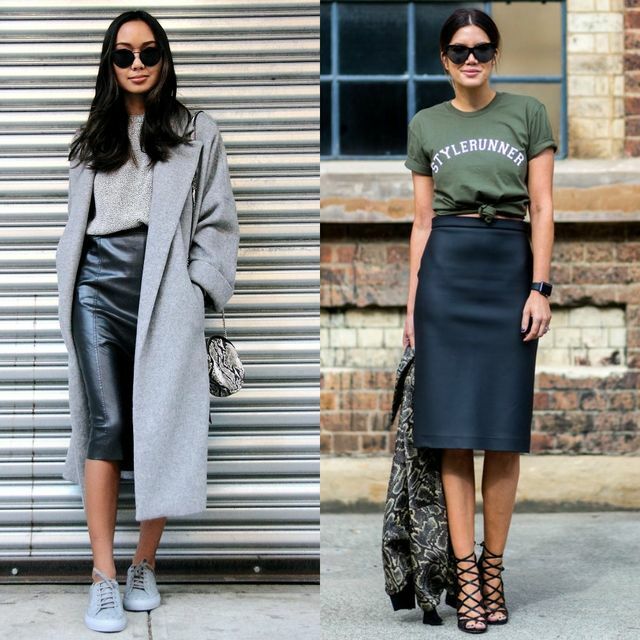 Choose one of these outfits with a black pencil skirt. 12. Even if it’s rainy, snowy or cold, that should not be an impediment for you when you want to be gorgeous. Next pictures are the proof that I am right. 13. High waisted black pencil skirts are my favorite choices. I just love these outfits!!! Don’t you? And speaking of love, if you wonder what to wear on a casual first date I would suggest you these outfits. 14. Taking risks with outfits options sounds like a good idea. However, you don’t have to change your clothing style from top to toe. Start with a few unpredictable yet stylish pairings like a summer outfits for teenage girl! 15. See the images selected by our team and decide how you want to sport a pencil skirt for a summer going out outfit with your friends or during the working days. 16. Fashion experts assure you that the classy women’s black pencil skirt should not be cut from your basic wardrobe. 17. Let’s face it! The crop top and high-waist skirt combos are for the ones who are proud of their silhouette and have confidence in their attractiveness. 15. In case you prefer to shift the attention to your unique style and silhouette in a less cheeky way, look for plaid shirts, lace blouses and loose tops to complete your daily sets with. Take a look at these black high waisted skirt outfit idea. 16.Whether you dig up a few cool black pencil skirts in your wardrobe or mother’s wardrobe or you hunt for the best deal at virtual stores, make sure you sport these timeless style creations regardless of the season. 17. This time go for a few pencil skirt outfits similar to the ones listed in our trend report. Tank tops, simple T-shirt and even summerish thick tops look gorgeous in a combo with these clothes. Copy this outfit for a nice summer club outfit. 18. Put together a few high waisted skirt outfits by choosing the texture and length that suits you and obviously, the occasion! 19. Whether you’re petite or tall, super-skinny, normal or plus size, I guarantee you, there is a black high waisted pencil skirt outfit for you out there. Even the crop top is perfect for summer festival outfit, the association with the black pencil skirt and the flat sandals makes us think more to a casual summer outfit. 21. Inspire other fashionistas with your non-traditional and admirable style options for black leather skirt outfits. Nowadays, perking up your office or formal wear is not sooo difficult. After all, you have faux leather, velvet and classy cotton to count on. Include this outfit in your collection of pictures in order to find winter outfit ideas for going out or what to wear on a first date in winter. 22. In case you want to create a professional and mature look, put on a high-waisted skirt that sits lower and will not concentrate purely on your bust, choose a white or neutral colored shirt or a lovely blouse and stilettos. Is not exactly the outfit that should be included in outfits for women over 50, but if you are an older woman you can adapt it to your style. 23. 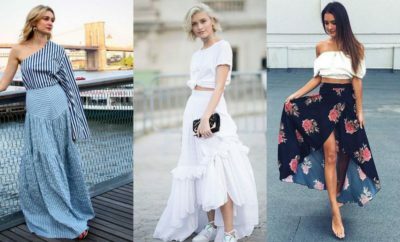 Flared skirts stole our heart, but some fashionistas feel like these designs seem a bit too romantic for occasions like: a meeting, an interview, a night at the club, etc. If you share their view, go for the tight skirt outfit as the one presented below. 24. In case you’re into versatile textures experiment with velvet, lace or chiffon. Keep leather, distressed denim and sequin for party events or weekends. Also valid for crop tops and off-shoulder blouses. 25. From basic office style essentials, black pencil skirts became a real obsession for the fashion squad. We’ve spotted numerous celebrities wearing this type of ladies skirt paired with cropped printed tops, loose blouses and silky shirts. Include this outstanding outfit in your going out summer outfits. 26. 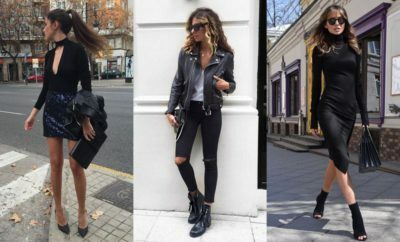 Black leather always demanded the attention of designers and stylist.Though this texture is not always associated with heat and warm season,but more with the fall outfits for women, you can still make it compatible with the coolest summer outfits. 27. Mix a minimalist design with a back-slit or lace insertion with a simple white tank, also with lace to impress all your fashionista besties. 28. 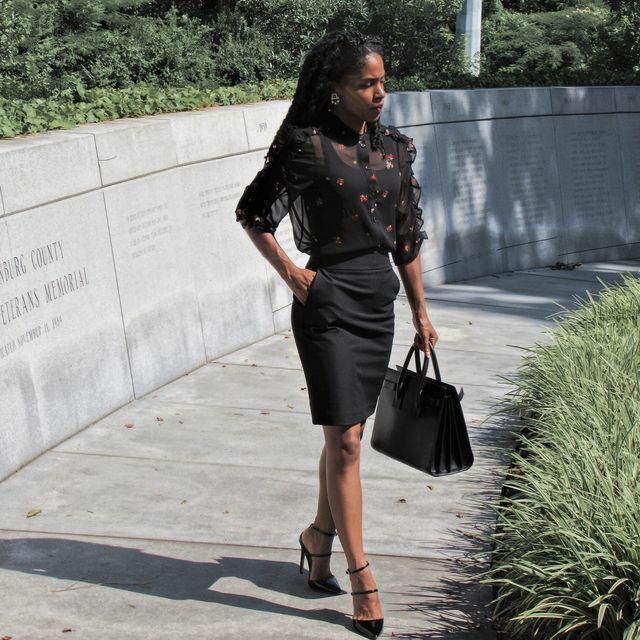 High-rising black pencil skirts serve as perfect semi-formal outfit elements that look gorgeous both with short- or long-sleeve blouses like the one below. Lovely way to style summer skirts. 29. Most of your OOTDs are centered around comfort? Here’s an on trend combo of a black fitting pencil skirt and an equally ‘hip’ off-shoulder grey top. Sneakers are a cool addition to this set. 30. Up the elegance of your date or work outfit by jumping on the off-shoulder top trend. 31. Decide the length according to your preferences and the attractive features you want to emphasize. 32. Black may attract the warmth of the sun. However, designers come to your rescue with textures that allow your skin to breathe. Thigh-high slits, versatile patterns and high-waist hems should be the details to look for. You might include this outfit in your list of cute outfits for dinner. 33. Denim has a casual air, however, famous fashionistas managed to incorporate this texture into party chic and even work wear. Wondering what to wear when going out for drinks? How about this outfit? 34. Really, it wasn’t too hard to find a few pencil skirts outfits with black leather skirts for ladies. These suggestions will definitely make things easier for you especially in the mix and matching process. 35. Fast-fashion stores provide you with a selection of mini or midi pencil skirts in various shades. While we limited ourselves to black you can also experiment with burgundy, brown and even red tones that add a touch of color and vivacity to your looks. 36. Build head-turning outfits associating sparkly or crop tops with high-waist skirts. You can also tone down your daily sets with laid-back or mono-color T-shirts and loose sweaters. Let me know which black pencil skirt outfit ideas did you like? Leave me a comment 🙂 ! I would love to here your opinion about these beautiful black pencil skirts outfits. 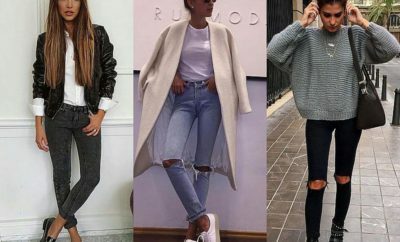 But if you like wearing jeans more then a skirt, you could take a look at my trend reports about how to dress up for a party with jeans or how to wear skinny jeans with ankle boots.